For the past several mornings (and the days that follow) we have had the privilege of watching a family of Bald Eagles on the ice in front of our house. While they are almost a mile away, they’re HUGE birds and appear to be even from a distance. The first morning we spent an hour watching them with the binoculars. They were huddled on the ice in a large group around the closest ice fishing shack. As our day progressed, we watched them again and again. They’d fly off, come back, re-group but always the same five eagles. Two with full adult plumage (white heads and white tails) and three all brown (immature). Never did we imagine that we’d get to watch them for days … and days! Our Marblehead family came up for an overnight and the eagle family thrilled them, too. Even with people playing out on the ice, the eagles remained. A neighbor was kind enough to tell us that the eagles are waiting for the left-over fish that were caught. It was a lightbulb moment for us but, man, those birds are patient! In the afternoon and evening we’ve watched one or two of the eagles fly off. Once down the lake right toward our house, several times toward the Advent Christian Campground next-door. Every time it’s thrilling to watch. Ned and the dogs and boys were out on the ice on Wednesday morning having a blast. The eagles were just beyond them on the ice. Amazing! We had a bit of snow overnight and it’s raining now and relatively warm (39 degrees at 8am). 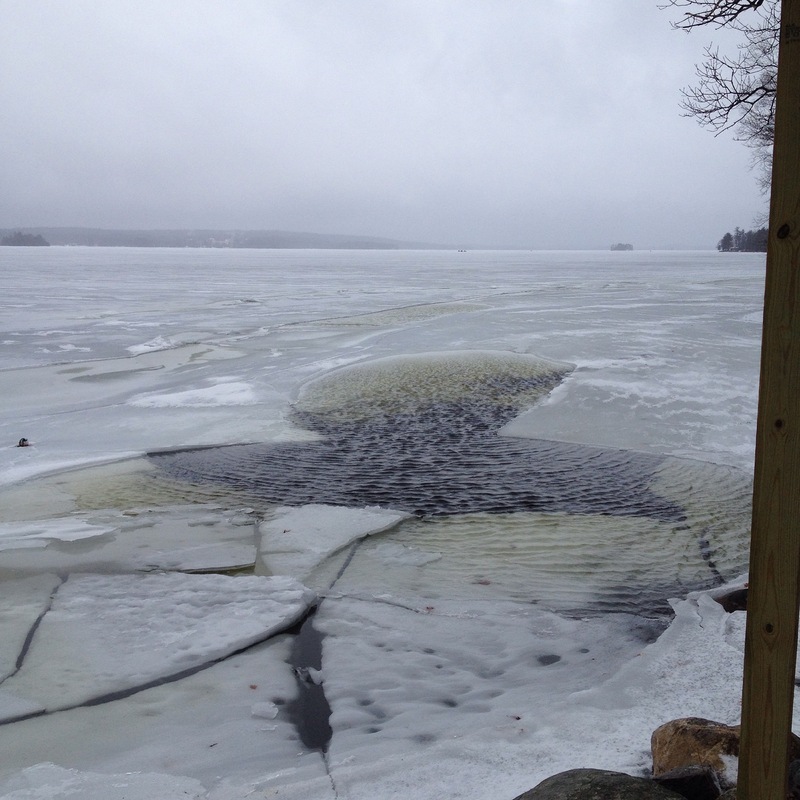 The ice in front of our house is all broken and there is open water this morning but the eagles are out on the ice. 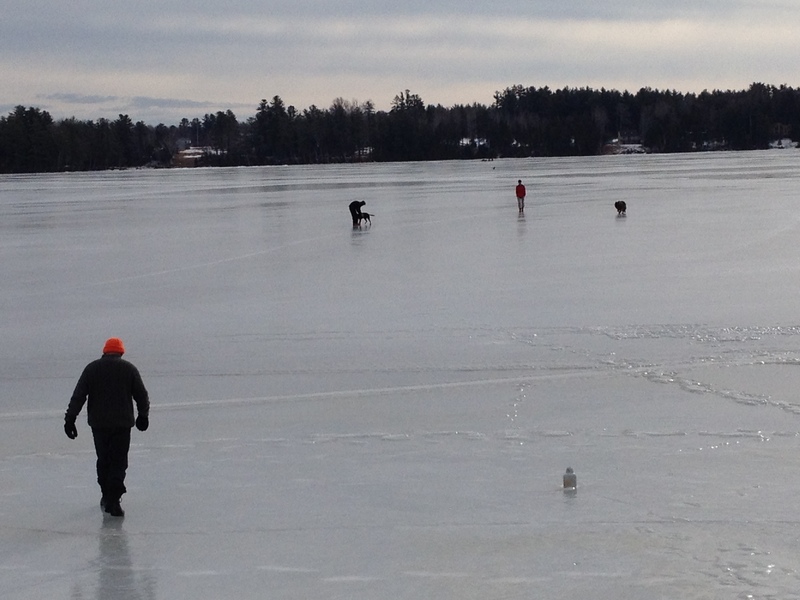 It’s Saturday and there are a lot of ice fishermen out on the lake. In my humble opinion, our view is spectacular but adding a family of eagles to the mix ups the game by several million! We don’t miss Florida even a bit. 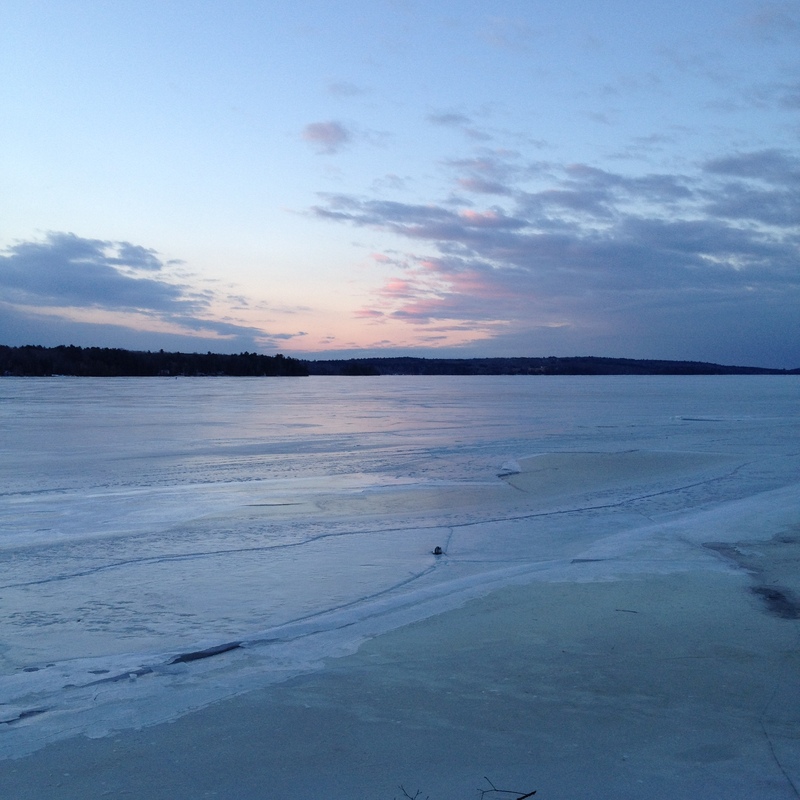 This entry was posted in Maine, seasons and tagged bald eagles, Belgrade, eagles on the ice, ice fishing, Maine, Messalonskee, Messalonskee Chronicles, winter on February 20, 2016 by lindarockwell3. One of these sat in a tree behind my place once a couple years ago. It was startling to see him. Such majesty.